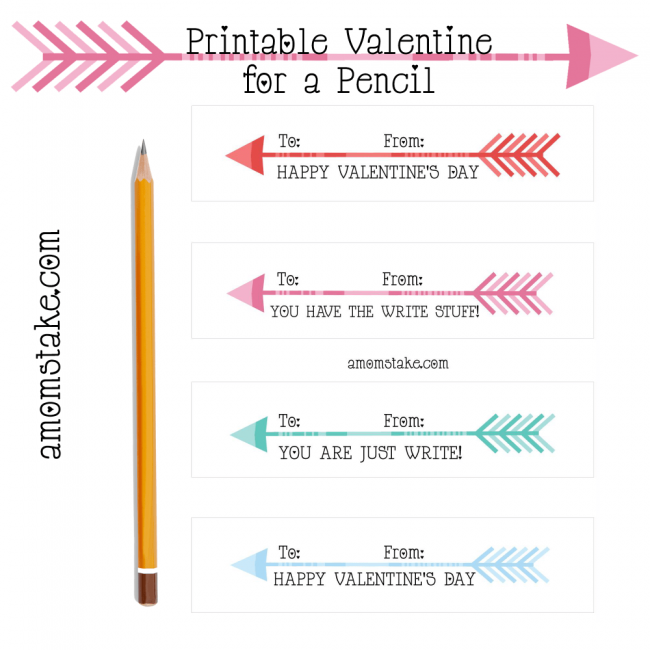 A really cute idea for classroom valentines to hand out, is to include a pencil! It is useful and practical and can be really cute on a valentine when done right. Best of all, it’s a non-candy Valentine’s Day card! 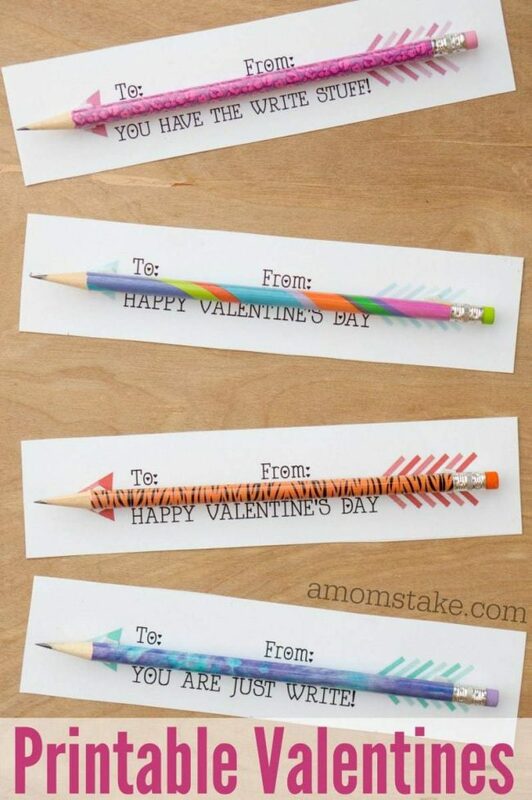 Today we’re sharing a cute way to incorporate sharpened pencils into an arrow designed classroom valentines printable we’ve created! These valentine’s will take just a few minutes to put together a whole set for your child’s classmates. Start with a count of how many students are in the classroom or preschool so you can plan your supplies accordingly. If your not sure, most elementary school classrooms have between 25-35 students. Download and print our Pencil Arrow valentines (link below) onto cardstock paper. 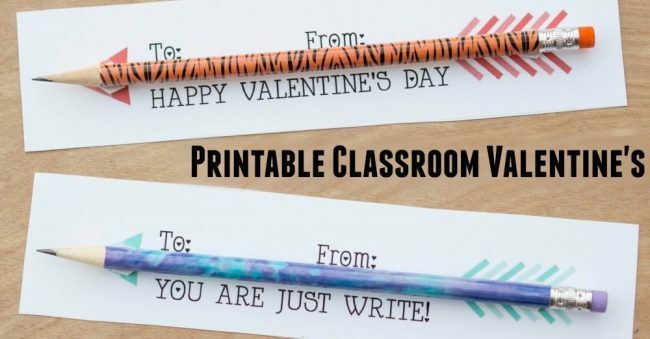 The sheet prints four per page, so print as many sheets as you need to provide a valentine to each of the friends or classmates. Next, cut out the valentines following the thin printed line or use a paper cutter. 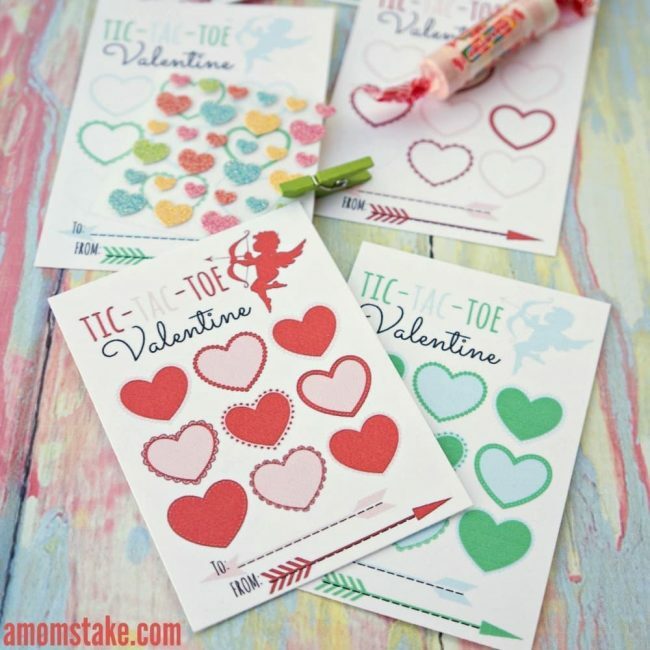 Add a 3D adhesive dot to each side of the arrow on each individual printed valentine. You’ll need two dots per valentine. Space them enough to give support to the pencil that you’ll add to the cards in a moment. Finally, press the pencil with the sharpened end acting as the arrow tip and the eraser end down by the feathered end. The 3D adhesives will really make this valentine pop! To download a copy of our free arrow classroom valentines printable, just click the link or image above. The link will open up a PDF file in a new tab which you can then print or save the file and use for your own personal use. Pop over to see our Tic-Tac-Toe Printable Valentines, next! These are so very cute! Would you mind sharing the name of the font? Thank you so much! This is such a cute idea! I love Valentine’s that include something usable rather than just more candy! Love it! I really like these, such a creative idea! Have to show it to my 6th graders to see if they’re still trading Valentines. These are fantastic. I love how cute they are and how unique they would be to give out. I love finding fun themed pencils for the kids for the holidays but it’s even more fun with these pencil printables! Great resource and ideas! These are adorable Valentine’s!! I am having a hard time believing it’s almost time for Valentine’s already! I know my kid’s would love to give these to their classmates!